Получил задание на динозавра примерно когда было 300 опыта. Согильдеец получил это же задание при 140. Смог собрать на скиле 232 случайность или так и должно быть? получил возможность собрать на 114, до этого собрал примерно 3 артефакта ископаемых. Подтверждаю что чистый рандом и от навыка не зависит. оба раза как 1й редкий Арт. Прокнул на 120, у меня пока первый редкий артефакт. Прокнул на скиле 39. После одной собранной окаменелости, будет моим вторым артом. Прокнул первый артом окаменелостей, и вообще первый артом профы. Петомец стоящий и красиво выполнен... На 25 будет очень даже полезен по умениям. Received the entry to create this in my archaeology book after creating 6 fossils. Three were unique and three were repeat. Skill level 130.
aaawwww look how cute your are, yes you are.......OMG my Finger! I received this project with 215 in archaeology, despite that it says 525 here. I received this at level 146. As has been suggested, I was saving up my projects until 100 but I got sick of it at 96 and finished everything I could, which was 10 projects. When I completed the final one, in fossils, I saw that this was my next one. It takes 85 fragments to complete and there is no stone or rune or anything to allow you to speed this up (not sure if there is for any fossil). it took me about two hours to fnid enough fossil sites to complete it; by the time I finished, my skill was at 206. Just got this, 2nd in the Fossil collection, and 8th overall. Good luck! Just got this guy, 2nd fossil project, and 8th overall, skill @ 119/150. This little guy takes 85 fossil fragments to complete. As there are no fossil keystones, you'll have to be reliant on just surveying to get him. You can get this with an Archaeology level as low as 129. I just got it today, or rather I got the opportunity to start collecting fragments for it. I have started this one at 102 archaeology skill! 3 common fossil artifacts completed so far (6 overall). Yay! My Archaeology skill was 75 when I was able to start this one. I had 4 artifacts before that, 3 night elf and 1 fossil, all common. It definitely seems entirely random when you get it. Based on others posts, I think it's random when you're able to get this one. I have completed 10 common fossil artifacts, with a skill of 301 before finally being able to make this beauty. I got this guy as my 4th completed archaeology artifact. It depends on your luck. Just saying, you don't need Archaeology 525 to get this Lil guy, i got him at 200. I picked this little guy up at around level 85 skill, and he was maybe my fourth or fifth creation. i got this at 290 skill. its my 31st artifact.. 3 were rare and 28 uncommon. Its my 7th project atm,just started it.I confirm u dont need max,just a little luck. I am at 194 atm. I just got him with archaeology at around 140 but it says 525 here, does that mean you can get Zinrokh and other epics that say 525 on wowhead at around 140 archaeology as well? Rewarded me 15 skill points at least. I was at 135 and thinking it would only take me up 5 points I completed the artifact. It took me up to 150 skill, which was my cap at the time, so it might award more skill points than 15. Finally got this pet! YaY! Its Adorable! problem is that its too small and many might not see it as its kinda tiny. But who cares, i got it! I discovered this tonight at 167 skill. Takes 85 peices to complete. This was my first rare on my lvl 80 Alliance Warlock. Got this at lvl 116. It was my 4th Fossil Project. Wow he is really tiny! He is my first rare and I got him at 220 skill. I recieved this rare as my first rare found, which gave me the achievement and Assistant Proffessor title. I was lvl 160, and creating it brought me to 175. I recognize this. It's Vegrandisaurus Citatus. I got this rare as my 6th fossil artifact. I got this as my 6th fossil artifact at skill level 152.
this pet is very rare its counted in the raptor pet series and i love it! The rares come at anytime. I got the hatchling on my second fossil. A friend got a Clockwork gnome on the 3rd Dwarf. Its all the matter of luck. 100% random when you get it. This is my first fossil artifact. This is my 2nd fossil projet and maybe 5th/6th overall. I started it at skill level 65. (Was 60 before solving my first fossil, and the left-over fossil fragments turned into the beginning of this one at the same time as I got 65). my first fossil solve also my gf was not happy lol. I was around 300 in archaeology when I got this project as my first rare fossil. I also had started my first rare of any sort around 265 or so. 100% random. The RNG is diabolical. There is no skill requirement to discover this artifact. After training archaeology on an alt, this was my first project overall (not just first fossil) as seen in this screenshot. However, judging by the Fossilized Raptor's currently accepted low skill requirement, this may not set a precedent for other superior-quality artifacts. I got the thing on my 4th or 5th Fossil artifact. 58 Archeology skill. Now have a reason for this profession. 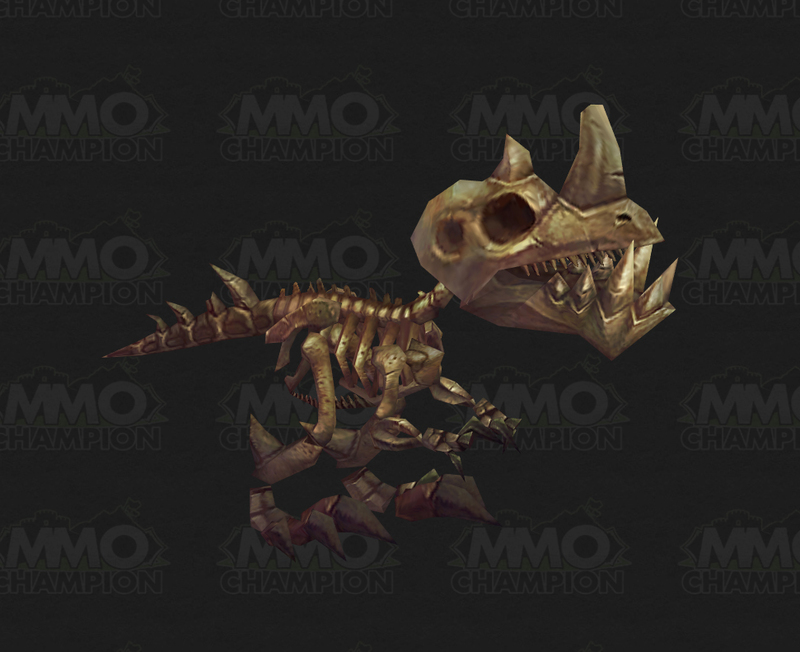 I want the Fossilized Raptor mount now. Can't wait 'till I'm on it and my little raptor is next to me. Just an fyi to anyone looking to track their digs to look for specific fragments or just simply have an easier time finding the artifacts, a couple of helpful addons are gatherer2 and archaeology helper. It works the same as gatherer does for herbs and minerals. http://wow.curse.com/downloads/wow-addons/details/arh.aspx http://wow.curse.com/downloads/wow-addons/details/gathermate2.aspx They can drastically reduce on-the-ground time tracking the items and help log previously farmed nodes. A must have for anyone serious about getting those nice little perks form this profession. You must have gatherer2 for archaeology helper to work though. I don't remember which fossil solve this was for me, but it was my first rare and came up early on. Skill was probably at 200 or below. 7 commons, 1 rare, then this one. I got lucky because this was my first unlocked artifact after learning Archaeology. It gave me 15 points in Archaeology after I finished it (70-85). I got the FH some time ago and keep it out most of the time. Today I was in The Savage Coast, digging, when I noticed it had turned into the Lashtail Hatchling. Obviously a glitch - but a charming one! i got it on my 3rd solve, luck of the 2 percent irish! I've got this in my inventory but when i click on it it says "Can't add companion to your account" :S Any idea why this would be? Собрав скелет с помощью заклятий тайной магии, вы вернули ящеру жизнь. Он оказался на редкость славным спутником, да и еда ему практически не требуется.